In early October (2010), dignitaries gathered at the Wellington County Museum and Archives [www.wcm.on.ca] in Fergus, Ont. for a ceremonial tree planting. The sugar maple sapling sown that day marked a very auspicious milestone: It was the one-millionth tree to be planted under the County of Wellington’s award-winning Green Legacy Programme [www.county.wellington.on.ca]. When it launched in 2004, the GLP was envisioned as a one-off project to celebrate the County’s 150th anniversary. 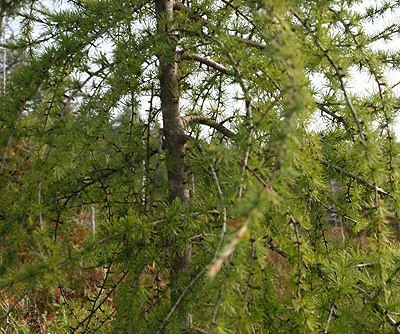 County workers and volunteers raised 150,000 trees, available in more than two-dozen indigenous varieties including tamarack, butternut, American elm and red-osier dogwood, that were to be planted across the region. 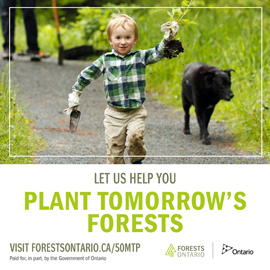 “Our main focus was to increase forest cover in Wellington County. Ideally, you want about 30 percent cover,” says communications officer Andrea Ravensdale. The mixed Carolinian forest that once covered the area had been clear-cut more than a century ago to make way for farmland. By the time the GLP launched, parts of the region were only 13 percent forested. More than doubling that amount was certainly an ambitious goal, particularly when you consider how many individual plants it would take. “We didn’t think 150,000 trees a year was going to be possible, but it resonated really positively. We actually have more people that want trees than we have trees,” says Ravensdale. By popular demand the GLP has continued every year since and has grown to become the largest municipal tree-planting program in North America. 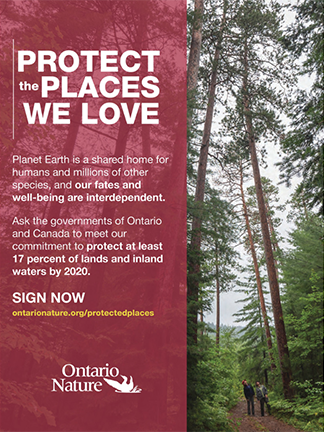 “We plant more trees [on a per capita basis] than the province of Ontario,” says Wellington County senior planner, Mark Van Patter. Since then, a number of innovative programs have blossomed under the GLP, providing area residents, businesses and environmental groups with free foliage. (See the Winter 2010/2011 issue of ON Nature for more details on two projects that fall under the GLP umbrella: Trees for Mapleton and the Living Snow Fence Programme.) Each year, the total planted across the region grows by 1,000 so, in 2011, a total of 157,000 trees will be planted. The program is funded entirely by the County, and Wellington’s own nursery annually raises about 155,000 seedlings and 7,500 saplings for the various GLP programs. Demand is so high that talks are underway to start a second nursery and the County is developing a DVD about the project to distribute to other municipalities and environmental organizations.